This juicy piece of social networking news slipped by me (I blame jet lag):: 4500 MySpace users had their account emails and passwords leaked and posted online (link no longer works). Apparently, Digg was the medium of choice for spreading the data. I've heard that the data might have been from a mix of social networks, not just MySpace, and might have included up to 50,000 passwords. Not that big of a privacy nightmare since the point of social networking is to publicize your life and connect with others although users with private profiles might be feeling a little more reticent to be candid now. Still, it does remind users of any online service to be careful with their personal information. 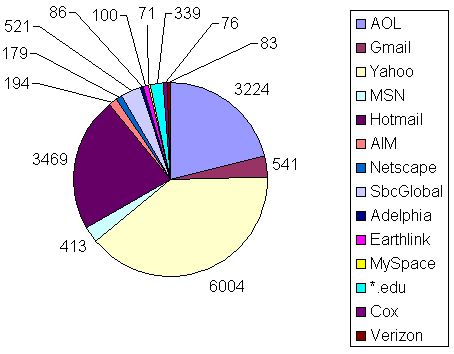 Space, abc123, and password aren't too surprising to see, but cookie123 and pablobob seem a little unlikely to be chosen in common by several different users. I was shocked the other day to find a comment in my myspace page from a friend’s daughter about male enhancement products her boyfriend was using. I assumed her profile was hacked but now I understand how.